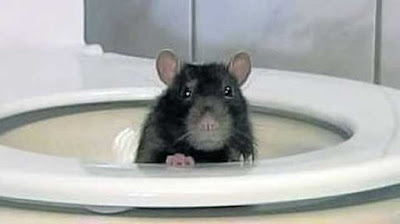 People in County Cork, Ireland, have been advised to watch their backsides after a man in the Midleton area was bitten by a rat while sitting on the toilet. On Monday, Councillor Noel Collins reported the incident to Cork County Council during a Southern Area Meeting, after asking them to investigate the possibility of flushing rat poison through the sewer system. “Recent flooding resulted in another problem for residents, that of rat infestation, which really upset many families, mentally and physically, and indeed, one elderly gentleman suffered a rat bite to his posterior while using his toilet, and had to receive immediate medical attention,” he said. God's creatures, leave them alone. The world was not meant for humans to just do as they want. Share the bloody planet …or BURN IN HELL for ever and then 4 more days. Geez, the rats are just trying to have a life.